The exhibition market is flooded with cheap banner stands, but what should you really be looking for when you purchase a banner stand? What is a Banner stand and why do I need one? Let’s get one thing clear first, and establish what a banner stand actually is? Banner stands are portable display stands constructed to display your graphics. There are lots of different types of banner stands but the common theme is that they are free standing, portable and flexible. 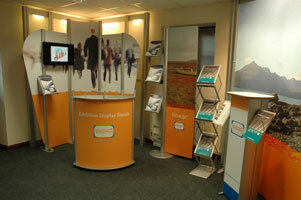 As for why you need one, simply put banner stands are a brilliant way to promote your business or marketing message. They give instant impact to your customers and they are easy to use and are a great product to take to exhibitions and trade shows. So what should you think about before buying a banner stand? What type of banner stand is most suitable for my business? • Roller banner stands – Roller or retractable banner stands work using a tensioned roller system which retracts the banner into the actual banner stand base. Their proven reliability makes them a popular choice. Pull up the graphic easily and when down the graphic is protected. The down side to consider with these banner stands is that they can’t be linked. • Tension banner stands – These banner stands are used with telescopic poles or fibre pole to create tension. 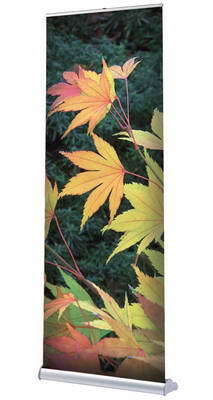 The benefits of them are that they are lighter than some other banner stands and some can be linked. Magnetic tape can be added to create seamless display. They are very flexible as additional replacement graphics can be changed easily. •	Rigid banner stands – Static or rigid banner stands work by fixing a separate graphic to the top and bottom of the static banner stand hardware. However they are limited on stability if they are too tall and they are not portable. • Removable cassette banner stands – Removable cassette roller banner stands are easily interchangeable and don’t require any assembly tools. They are strong but still lightweight. The benefits of these banner stands means you can order many different cassettes and change your graphics at will. Have you got the right size banner stand? Banner stands come in many different sizes. The size you finally decide on will depends on the job that you need it to do. For example If you’re relying on your banner stand to make up the majority of your exhibition display, it is a good idea to choose a large banner stand and compliment with literature holders. A variety of smaller banner stands with different graphics to promote different products may be a better choice than a long, wide single stand if you need flexibility. You can angle the banners to give visual interest and have different products on each banner stand. How easy is it to set up and is it flexible? Banner stands are a popular choice because they are easy to set up. Choose one that can be disassembled and reassembled easily and quickly. This is particularly important if you are going to be taking it on the road and travelling frequently to trade shows exhibitions. The weight of the banner stand is also a consideration if you are a woman on your own having to lift it and set it up on your own. A heavy banner stand heavy defeats the purpose but you also don’t want to choose a banner stand that is going to fall over in slightest breeze or that won’t stand up in a high traffic or foot fall area. Easy installation of graphics is another important consideration. How much does the banner stand cost? In today’s economic climate price is definitely an issue. But don’t buy a cheap banner stand!! Companies selling cheap banner stands can only do so by using inferior quality materials. They will not last!! The graphics will fade and the hardware will break and you will only end up having to replace the banner stand a lot sooner than you wanted to do so. However, you shouldn’t have to spend a lot of money to get a good banner stand and banner stand graphics. Banner stands are cheaper way of advertising than more complex display set-ups like pop up stands. The printed materials POD Exhibitions use for their banner stands caters for four different prices and ecological needs with the same quality of printed image on Ecolam LS, Premium LS, Ecolam and Eco Friendly. Does the price include graphics? What is the price with VAT and delivery on top? Banner stands area a great medium of presentation and an effective advertising tool that you shouldn’t be without. When looking for a banner stand choose the most cost effective, flexible banner stand for your business. Please call 01933 411159 to make an appointment to see our banner stands.